TL;DR – I use Lightroom’s Smart Collections alongside star ratings to move photos through my workflow. I keep them all in a synced collection so I can edit on either my desktop or laptop. First I’ll talk you through how I use the process. Then, if you want to implement the workflow yourself, I’ll walk you through how to set it up. See if this problem sounds familiar. I’m a wedding photographer, meaning I have thousands of photos that need editing at any one time. One is a powerful desktop with loads of processing power and tonnes of storage. Naturally this desktop is where all the raw files are stored and I do all my Lightroom processing. The other is a mid-range laptop which, up until now, I only really use for client meetings and coffee shop blogging. I would love to be able to pick up the laptop and get on with some editing in the waiting room of my kids’ dance class. The only way I could think to do this previously was by keeping my Lightroom catalogue on an external drive. This never sat well with me though because I had doubts about the performance and reliability of such a solution. Somehow, whilst playing around with Lightroom CC (not the classic version), I started to wonder whether I could use that on the laptop to achieve my goal. This new workflow is the result of many months of wracking my brain to figure out how to make this work for both culling and editing, whilst not involving constantly moving files in and out of synced collections. I import the raw files onto my desktop using the Lightroom Import module, then build smart previews for all files straight away. Usually overnight if I’ve just gotten home from an all day wedding. At the same time the smart previews are building I use my file explorer to copy the raw folder onto my external NAS drive for backup. I also have Backblaze sitting on my desktop meaning all the raw files are also being uploaded to the cloud, thus creating my off-site backup should anything drastic happen to my house. This is the clever part. This is what makes the syncing work. When you import your new photos, make sure you add them to the ‘Synced Folder’ collection. This will load all your photos into the cloud and synced across your computers. Any changes you make on one will sync across to the other. This includes the star ratings that you will be setting up further down. 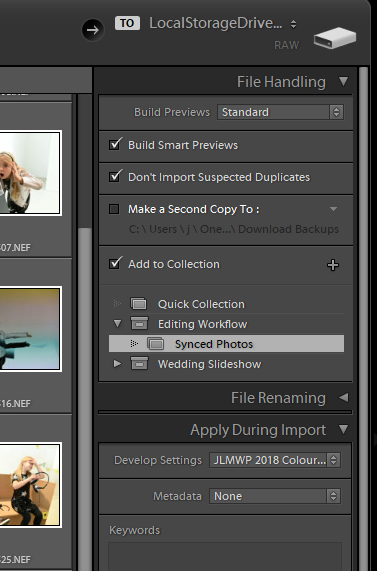 Unfortunately, due to a limitation in Lightroom (at time of writing, October 2018) it is not possible to sync smart collections in Creative Cloud. Using this synced folder is a workaround I have come up with. The next step in my editing workflow is culling the photos. This is a process of eliminating all the duffs and duplicates so that I am left with the final collection of photos that will be delivered to the client. I have setup a Smart Collection in Lightroom on my desktop which contains all 0-star photos in the Synced Photos collection. 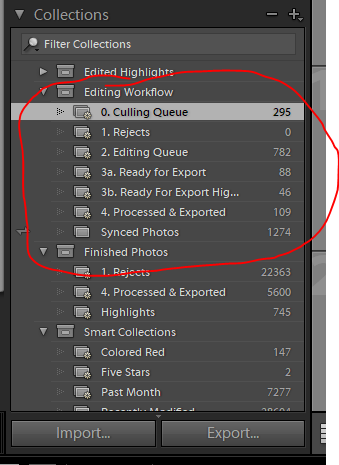 The ‘Culling Queue’ smart collection is therefore every photo that needs to be checked. As I process each photo I change the rating to either 1 or 2. 1 star means the photo will not be delivered to the client, i.e. a reject. 2 stars is for photos that will go on to be edited and delivered. Using this number rating system is actually a really quick way to cull photos in Lightroom. All you do is hit either 1 or 2 and it instantly drops out of the Culling Queue smart collection, putting the next photo in front of you. Sometimes when I’m culling, if I am struggling to decide whether a photo is a keeper, I will actually go ahead and edit it straight away. For those photos I can give them a 3 star during the culling process so that they skip the editing queue and jump straight into the Ready For Export bucket. Another great time saver. I can also change the star rating of a photo in Lightroom CC, meaning I can cull on the laptop and the changes will pass over to my desktop. The next Smart Collection that I have setup is the Editing Queue. This is basically all photos that have been flagged as 2 stars during the Culling process, i.e. ready to be edited. As I work through and edit these photos, each finished photo is flagged as 3 stars to say that the editing is complete. For the best photos I also use the Red colour flag to pick out an edited ‘highlight’ which I will use in the slideshow and on my blog. All the 3 stars move into the next Smart Collection ‘Ready for Export’. This step can only be done on the desktop because it requires the actual raw files. 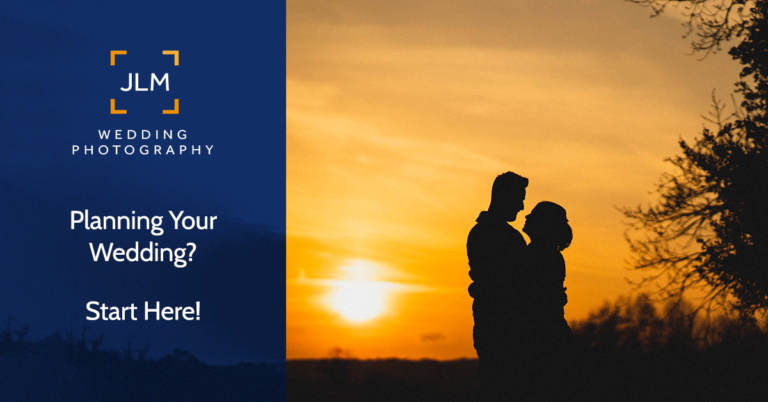 Once all the photos from a particular wedding have been fully culled and edited, it is time to export them to JPEG ready for delivery. On the desktop I select all the photos in the Ready For Export smart collection and do the usual right-click -> Export. When they are finished exporting I flag them as 4 stars. All the photos that I flagged Red as highlights go into another synced smart collection ready for export. I export these separately because I use different settings for my blog. Smaller file size, SEO names etc. Once I am happy that they have exported I change the colour flag from Red to Green so that they drop out of the synced Red smart collection but can still be picked out if I need to refer back to my highlights later. Once the photos have been edited and exported they can be removed from the Synced Photos collection. This is important because there are only so many gigabytes available on the Creative Cloud subscription, keeping up to date on clearing it out will save a tonne of work later. Don’t worry about deleting photos from this collection, you aren’t deleting the raw files and the ratings will still be in tact if you need to filter the photos later. If you think this workflow could work for you, here is how to set it up yourself. First of all, in order to employ this workflow, here are a few basic requirements. The workflow can work with only one computer. For the sync to be effective you really should have two. These can be Windows or Mac, or whatever else so long as they are capable of running Lightroom. You will need to subscribe to Adobe Creative Cloud, the Photography plan is sufficient. This will not work with the older standalone versions of Lightroom. Oh and a pretty solid, fast and ideally unlimited internet connection, since you’ll be syncing a lot of data back and forth between your machines. Internet out and about on the laptop isn’t so much of an issue so long as you remember to sync it when you get back home, more on that later. 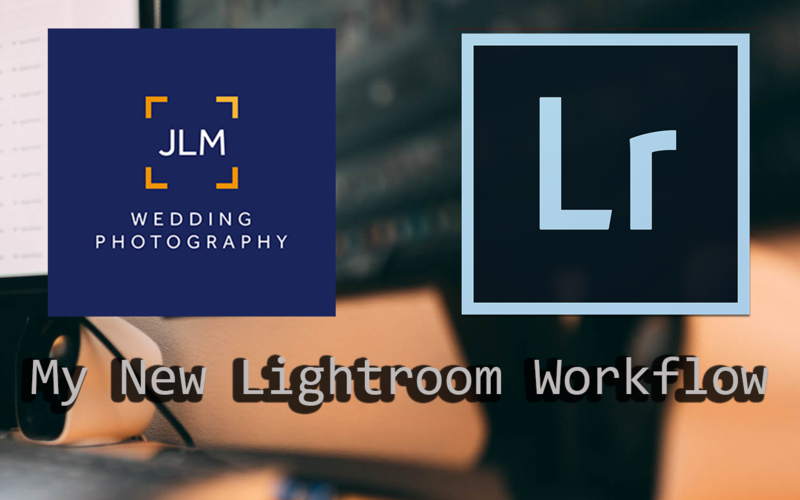 Before you can start to use this workflow you need to get a few things setup in Lightroom. You don’t have to organise this in exactly the same way that I have, this is just a guide to setting up how I have mine. First thing to do is to create a collection set, which I called ‘Editing Workflow’. Inside that collection set create a Collection called ‘Synced Photos’. Then you need to create the following Smart Collections, also in the Editing Workflow collection set. Source – Collection contains Synced Photos. Unlike most other Lightroom import settings, this one doesn’t seem to remember how I did it last time, so you need to remember to click this every time. I did experiment with having Lightroom Classic on both laptop and desktop, and keeping them both in sync. Unfortunately (again at time of writing in October 2018) this is not possible. So, for now, we are stuck with Lightroom CC on the laptop. This isn’t such a bad thing though, Lightroom CC does a decent job. Once you get used to it you can quickly work through the photos and change the star rating so culling becomes easy. So long as you applied your custom preset to the files on import then you should be most of the way there with processing too, just a few tweaks are no problem in CC. In order to keep things in sync, both your desktop and laptop need to spend a lot of time connected to the internet with Lightroom open. If you pick up the laptop and leave the house without doing a sync first, any changes you made on the desktop since the last sync won’t be on the laptop. You also need to remember to sync the laptop when you get home if you have been editing without an internet connection. Adopting this new workflow has made a huge difference to my image processing. Using the smart collections makes it really easy to switch photos between the Culling, Editing and Exporting stages. I find it much quicker now that I can cull photos with one press instead of two. Where I used to hit the rating and then the right arrow, now it’s just a quick number and it’s done. I can even click a photo straight into the completed stage if I think it doesn’t need any further editing, thus making my editing stage that bit quicker too. I enjoy this new workflow and am very pleased with it. If you like it too please do let me know. I would also love to hear about any tweaks or changes you have made to make it work better for you.